The 21-year-old mechanical engineer, who has made robots since the seventh grade, developed the kit with her sister, Lavanya, who is 19. They called it Pi-Bot because its chassis is shaped like the Greek letter Pi. According to Jawaharlal, a graduate of the University of Southern California, Los Angeles, building robots as a student in school gave her the problem-solving and critical-thinking skills needed to pursue a career in engineering. Through Pi-Bot, Jawaharlal wants to plant the seeds for more students to consider careers in science, technology, engineering and mathematics. The sisters have initiated a Kickstarter campaign to raise US$70,000 to build and commercially sell Pi-Bot kits to schools. They run a robotics education firm, STEM Center USA, in Pomona, California. "Robotics is a neat way to bring it all together," Jawaharlal said of the skills that using robots can help students to develop. "Pi-Bot is affordable, individualized, and most of all, exciting for students to build and program." Major IT companies have also started investing in robotics. Google has acquired a handful of robotics companies recently, while Amazon paid US$775 million for Kiva Systems and CEO Jeff Bezos floated the idea of using flying drones to deliver packages. Such moves have occurred at the same time as a major public-policy push has brought STEM -- science, technology, engineering and mathematics -- education to the fore. Hands-on science programs like robotics can positively influence a student's academic pursuit of STEM well beyond high school, said Barbara McAllister, director of strategic initiatives and planning at Intel. "I think it's a great idea and I'm rooting for them to be wildly successful. Something magical happens when you allow students to create and make stuff. Students are naturally curious and when you have their interest, education happens," McAllister said. Only one in 10 U.S. high-school graduates indicated interest in STEM careers, according to a study released earlier this month by testing organization ACT. Women are under-represented in STEM fields, so female role models in those male-dominanted fields would have a profound effect, said Alicia Gibb, a New York-based hardware developer who developed Pathosbot, a roller skating robot. "It is really important for classrooms to have women to look up to as role models for who can build robots and be engineers," Gibb said. Offering physical computing experiences in classrooms will prepare students for dealing with how pervasive computing and Internet services will become in the next decade, said Anthony Mullen, senior analyst at Forrester Research. "It will excite their imaginations about the possibilities of automation, inform their views on the relationship between people and machines and give them a hands-on experience of the 'new engineering' that will be in demand when they graduate," Mullen said. 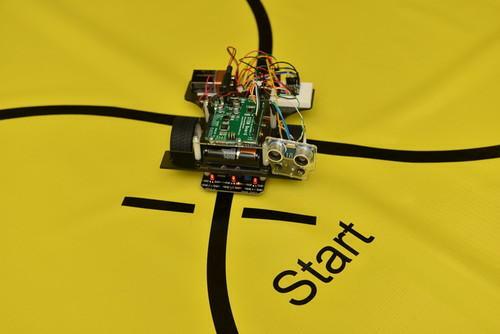 Students using Pi-Bot will be able to make robots that move in a straight line or autonomously navigate a maze aided by distance and light sensors, said John Caffrey, a professor of mechanical engineering, at California State Polytechnic University in Pomona who has worked with the kit. "When they learn how to program the Pi-Bot to do what they want to do, such as detecting light, responding to sound, controlling the motor speed, it becomes very exciting," he said. "Once you get this creativity going, the inspiration to learn the math and science will follow." The Jawaharlals' STEM Center has educated thousands of students in robotics in the U.S. and India over the last two years, with Pi-Bot prototypes built for classroom use. The robots are created by students using Arduino, an open-source electronics prototyping platform that consists of hardware and software used to make interactive electronic objects or environments. If full funding is achieved through the Kickstarter campaign, Pi-Bot kits will be priced at less than $100, which is less expensive than other prominent school-level kits from Vex, whose kits start at $399.99 or Lego, whose Tetrix Education Base Set is $599.95. The Jawaharlals are determined to raise enough funding. "If Kickstarter doesn't work, we're going to continue looking for funding," Melissa Jawaharlal said. There are basic robotics kits similar to Pi-Bot using Arduinos or Arduino derivatives, but the proposed price is competitive, Gibb said. "Higher prices push a lot of students and school districts out of the robotics market. Anything cheaper than what is available is groundbreaking and important so more kids can build regardless of their economic status," Gibb said. The Pi-Bot kit includes an acrylic chassis, a board with a microcontroller, a USB cable, wheels, gearbox, sensors, LEDs, resistors, jumpers, wiresets, four AA battery holders and other components. The first kits will ship in June. Artist Addie Wagenknecht likened Pi-Bot to Lasersaur, an open-source hardware cutter that she co-developed at a fraction of the cost of available alternatives. "As students, we wanted access to machines which were prohibitively expensive. We built our own so others could benefit from it as well," Wagenknecht said. The use of Arduino in Pi-Bot is a good move, making it simple to use and replicate, Wagenknecht said. "When working with students, I found the projects that are the most successful need to have minimal parts and be easy to program -- at least when you are learning the foundations," Wagenknecht said. Pi-Bot is meant to be a basic introductory kit, Jawaharlal said. Robots can be programmed to switch on light bulbs with a snap-on robotic arm, but young students will find it challenging to write multiple layers of code, Jawaharlal said. "When you're getting introduced, you don't know if you want to spend $500 on a robot with a camera and a robotic arm. We plan on expanding this to become a line of products," Jawaharlal said.